NAMED TOP 8 CAT PRODUCTS REVIEWED IN 2016 BY FLOPPYCATS! 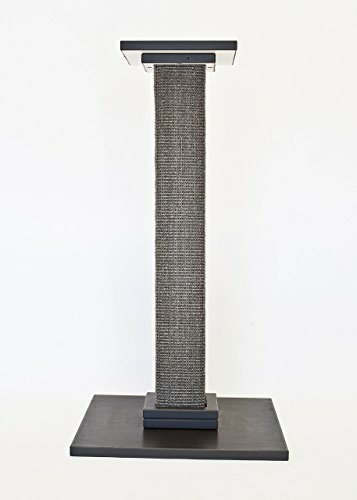 The Felix Tall Cat Scratching Post stands approximately 28" high and is recommended as it gives your cat extended surface to scratch and exercise. The post is handmade using natural sisal, certified organic catnip, and real wood that is certified by the Sustainable Forestry Initiative. The base is 16" x 16" and the top is 8 3/4" x 8 3/4". The top and base are made of a dark wood grain laminate over wood composite core. Core contains no formaldehyde, which meets Green Building Standards. Assembly required. If you have any questions about this product by Felix Katnip, contact us by completing and submitting the form below. If you are looking for a specif part number, please include it with your message.